Well, I bought another tank! The Nuvo 24 is starting to get packed and I can't resist shopping for corals/clams so I need to expand. The new tank is going to be a slow project as I am going to be waiting until we move to make the swap (likely in Feb. of 2015). The tank is a rimless 48x18x18 with starfire glass on 3 sides. 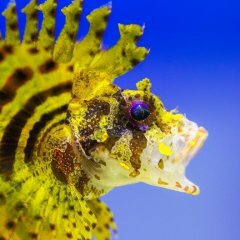 Livestock: My current livestock + more clams + Anthias Shoal + more. Here is the completed (but not glued entirely) return manifold with two T's for reactors if I decide to use some. Not shown is the flex connection to the return pump. Sweet find ! I have always like the bigger Solana tanks / can't wait to see this up and running..
sweet grab. agree can't wait to see it up and running. Are you planning to have both tanks or transfer everything into this new one when ready? Egginis, I am planning to transfer. That will either be a nightmare (if we move far away) or easy (if we move close by). I purchased a used skimmer today, looks brand new. Reef Octopus NWB110! Anyone have thoughts on the best DIY 20L sump layout? 2 has the advantage of being able to control water flow speed in the refugium. 1 could allow for more time to control micro-bubbles, which may not be an issue if I do the baffling correctly. Been reading a lot of DSR (Dutch Synthetic Reefing) and Triton method. Might try the DSR method on this tank if I can decide to invest the time in the regimented testing. No water changes may make up for the time testing though. My only scare is the idea of dosing Iron into a tank that will be heavy in clams. Normally the Iron is no issue but if the clams develop any sign of pinched mantle it will likely wipe them out if I keep elevated Iron levels. I'm going to build one of these fixtures and use it for my Nuvo 24 until the switch over to the big tank, when i'll build a second. This should give me over 200 par on most the sandbed. Clams ahoy! So plans have changed some and I am moving into a nice house. Along with that house is a huge basement with a perfect space for tank and a closet on the other side of the wall (with drain and water hookup to boot!). So the Solana 67g will now be my refugium. Its huge for one, but I have it so why not. 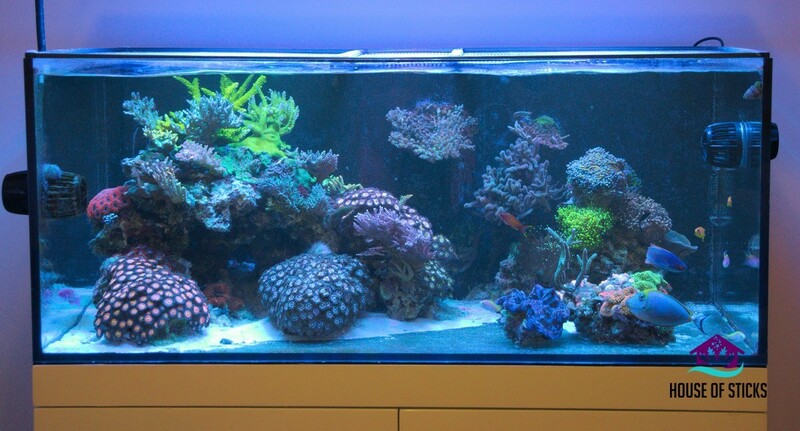 I am ordering a CAD Lights 100g tank as the main display that will be in the basement room. Both tanks will be piped to a 40g breeder sump and a Vertex 150 skimmer. Thanksgiving was both great and horrible for me. While getting up from the dinner table I dropped my Lumia 1520 phone and shattered the screen. I bought a used Cadlights 100g tank from a LFS and brought it home a couple days before thanksgiving and set it up on padded carpet on the porch. Proceeded to fill with water for a leak test. Went well till the next night (Thanksgiving night) I check it and the back pane of glass had cracked right down the center behind the overflow. I'm 99% sure the surface the tank was on was perfectly flat, I think maybe that back glass has a stress fracture from moving. Sigh. The NEW Cadlights tank is now on order. Your not having good carpet luck... Too soon? haha very true. The 100g tank that cracked was on carpet but not in the house. I guess I have really bad carpet and glass luck. Great job with the plumbing. How did the leak test go? Went well. Tiny tiny leak on the return somewhere between the bulkhead and the flex pvc (im not using the manifold above). This skimmer is a work of art. Vertex Omega 150 w/ Avast Marine neck cleaner (I have the locker also but ordered wrong size). Perspective makes it look a little top heavy. Sigh. Cadlights says tank is delayed till after x-mas. Seriously? That is a bummer. So some progress has been made. The 67g tank is setup and cycled (14day Zeovit cycle) - the majority of the sand/rock will be transfered to display tank once that is setup. A good deal of the plumbing is dry-fitted and ready to go. Went overboard buying plumbing parts so some stuff will be going back to Lowes/Home Depot. APC Battery backup is mounted and the Apex + Electronics for tanks will be mounted to the top board above it. The battery backup will probably only run my Gyre to maximize it's rundown time. Misc stuff is installed like shelving, workbench, whiteboard, light hangers, etc. RODI Stand and container are built and setup. 28g square brute is awesome. Baffles have been siliconed in place in new 40b sump. This will be going under the 100g display tank and will be the common sump for both tanks. The baffles are not quite the normal setup but I needed a tall glass piece facing the return chamber to mount my ATO/Doser/Probe holders. Pic dump time. Keep in mind a lot of this stuff is work-in-progress. Pretty much all thats left now is to get the 100g display tank and plumb it up to the 67g, and then get it all running and transfer my livestock! More shelving (the top shelves will be painted with Kilz in a couple days from now). This will primarily house my doser and dosing containers. 40b Sump in roughly the position where the display tank will be. I'm really stoked for this build!!! Yep! 67g and 100g. Plus the 40g sump.